Our goal is to, “protect your family’s peace of mind.” Our company is driven by our core values: honesty, trust and respect. This is what the customer expects from us and what the people within the company want from each other. This is accomplished through performance and by example. Our "raccoon man," Jake, was superb, appropriate and personable, a gentleman. His descriptions of the mother raccoon and her three little ones were compassionate for our plight as well as for our uninvited guests. They were difficult to catch. It was a week and a half before they were all out of the tiny space between the second floor ceiling and the underside of the roof. Jake came every day with the same hopeful, smiling look, which kept us hopeful and smiling, too. It could have been so easy to be discouraged, especially since we had house guests for one week. Twice he came out at unscheduled times to check on sounds we had heard in the walls, including in the water pipe "playground" surrounding the backside of the bathtub. In fact, Jake lured the fourth critter into a cage through the plumber's access to the tub! We have photos to prove we had raccoons, and there is one photo to prove that our Varment Guard hero is a man named Jake! Extremely impressed with the knowledge and professionalism they showed. We have had other companies out to our home in the past and I wish we could have found them sooner! Not satisfied at all. We contracted Varment Guard to do bat exclusion on our building. They showed up with a lift, and spent less than two hours on the job, claiming to have sealed 288+ access points. Then they left their lift in our parking lot for a week (and it's still there), and stopped returning our phone calls. When we called, they told us that our contact person had changed, but refused to connect us with the new contact person. Then they just stopped returning our calls. 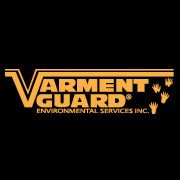 We are convinced that Varment Guard is stalling so our warranty will expire.